Graeme Sanders, a Te Awamutu trainer, boasts one of the best records of any trainer in New Zealand. He first trained in partnership with his father, training great Bill Sanders, in 1970, with the duo winning the trainers' premiership five times that decade. Since then a constant string of topliners have emerged from the stable, most notably in recent years the dual Auckland Cup winner Prize Lady and injury-plagued star Pasta Post. Sanders said he was just 21 when he joined his father in partnership. Sanders had a break from training and went farming for 10 years before returning to racing, and in recent years he has taken into partnership firstly his daughter Debbie Sweeney and then, when she had children, his son Mark. He is now back in training partnership with Debbie. He said among his highlights were winning the Auckland Cup for a second year with Prize Lady and winning the Wellington Derby with Love Lace Watkins in 1980, a galloper he part-owner himself. Among other highlights are Mr Hickeys' two Great Northern Hurdle wins, Australian success on several trips there including through the likes of Mr Hickey, Beowulf, Rural Prince and Anne Carina, and the exploits of former star two-year-old Ballroom Babe, a winner of both the Gr I Sires' Produce Stakes races and a Gr I Captain Cook Stakes as an older horse, Fanatic NZ Oaks. He also fondly remembers preparing Seachange for two races in the final preparation of her career in England. 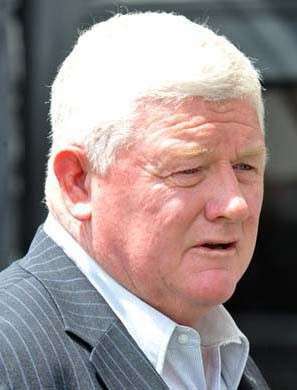 Sanders, who brought up 1000 training wins in January 2006 continues to be actively involved in the racing industry as he has also experienced the role of an administrator in New Zealand racing. He spent four years on the Board of New Zealand Thoroughbred Racing and is also a long-time committee member of the Waipa Racing Club. He currently has over 1200 winners to date, over 45 Group and listed wins and 20 Group 1 wins.